to a height of 2' tall and just as wide. 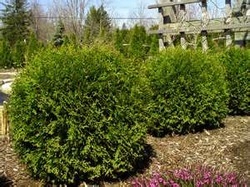 Use Hetz Midget as a hedge, in a shrub border, or as a grouping in a landscape bed. Holmstrup Arborvitae likes to be planted in full sun.